Otosclerosis is a condition of the middle ear and mainly affects the tiny stapes bone. It causes gradual hearing loss. Treatments include hearing aids and surgery. The ossicles (bones) become knit together into an immovable mass, and do not transmit sound as well as when they are more flexible. Otosclerosis can also affect the other ossicles (malleus and incus) and the otic capsule. The human ear is divided into three parts: the external, middle, and inner ear. The external ear gathers surrounding sounds and directs them toward the ear drum. This results in vibration of the ear drum and the three small bones of hearing called the malleus ("hammer"), incus ("anvil") and the stapes ("stirrup"). This mechanical energy is then converted to electrical energy by the inner ear and is subsequently transmitted to the brain and results in what we call “hearing”. 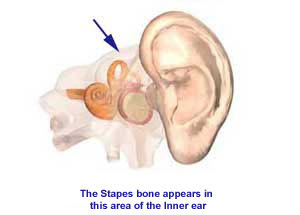 In most cases, it is just the stapes which is affected. However, sometimes, over time, otosclerosis can also affect the bony shell of the cochlea and the nerve cells within it. If this is the case, the damage to the nerve cells means that the transmission of nerve impulses to the brain can be affected. A different type of hearing loss, called sensorineural hearing loss, can then occur. The hearing loss associated with otosclerosis usually starts around age 20 but it may begin anytime between the age of 15 and 45. Both ears may be affected in 80% of patients. Balance problems (including unsteadiness, vertigo, or other sensations of motion) may occur in 25-30% of patients. Approximately 75% of patients with otosclerosis will develop a ringing or “rushing” sound in the affected ear (called tinnitus). For a mild case, no treatment may be needed, or just hearing aids. For more severe cases, a surgery called stapedectomy may resolve the situation. In a stapedectomy, the "bad" stapes middle ear bone is taken out and replaced with a prosthesis. Do not blow your nose for three weeks following surgery. If you sneeze or cough keep your mouth open. Keep your head elevated as much as possible. Sleep and rest on 2-3 pillows if possible. Do not get water in your ear. If showering/washing your hair, place a cotton wool ball coated in Vaseline in the car canal to seal it. If there is a separate incision keep this dry until your first post-operative visits. If you wear glasses either remove the arm on the operated side, or make certain that it does not rest on the incision behind your ear for one week. Replace the cotton wool ball daily until your first post-operative visit. Take your oral antibiotic as prescribed. You may use Panadol, Panadeine or Panadeine Forte for pain. Do NOT use Aspirin or other analgesics. If there is a separate incision a small amount of drainage may occur from this area also. If the drainage is profuse or develops a foul odour contact us. Popping sounds, a plugged sensation, ringing or fluctuating hearing may be occur during healing. Avoid travel by air for three weeks following surgery. If you should notice any swelling, redness or excessive pain, contact us. Some dizziness may occur after surgery. If severe or is associated with nausea or vomiting, contact us. Please contact our office to make an appointment to be seen 7-10 days after the time of your surgery unless stated otherwise by your physician.